New Orleans I love my job! Given the differences in international time zones there are surprises all hours of the day and night, because good organizing is happening 24 hours a day. We are about to celebrate this with the publication by Social Policy Press of Global Grassroots: International Perspectives on Organizing this week, but let me share a little flavor of it with you from India and Canada over the last day. At the other end of India in Mumbai, our friends with the Reality Tours among others have now joined in supporting the ACORN Foundation’s efforts to increase livelihoods in the Dharavi slums by collecting rags, doing simple production and sewing cotton bags to replace plastic bags. Just as the outreach in Delhi moves one protest, the outreach by our members in Mumbai to small area retailers will ask that they abandon plastic bags for our cotton bags over the next 90 day campaign. How great is that? Spice that with a column in the Waterloo (ON), Canada paper (http://t.co/lUDo7Ww) in support of ACORN International’s Remittance Justice Campaign and ACORN Canada’s release of our recent report on informal systems (www.acorninternational.org), a 100-person action in Ottawa against notoriously bad landlord, Transglobe, and interviews in British Columbia about the campaign as well, and I have to say, it’s a good day to remember how important and powerful this work really is. 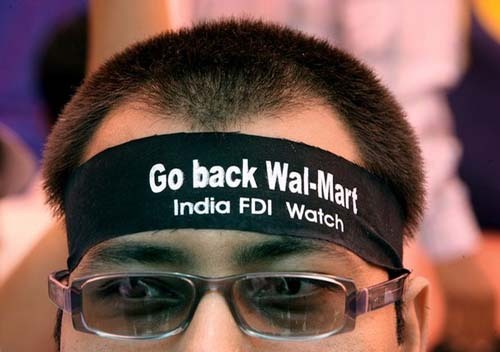 This entry was posted in ACORN International, Community Organizing, International and tagged ACORN International, global grassroots, india FDI, transglobe, WalMart by wade. Bookmark the permalink.